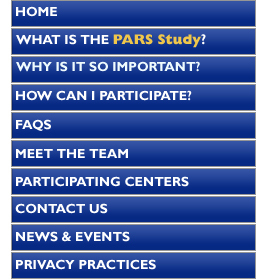 Why is the PARS study so important? The PARS study will attempt to show that Parkinson disease can be identified in its earliest stage. In the future early detection combined with neuroprotective therapy may make it possible for interventions to begin early in the disease and slow the progression or even prevent the onset of motor symptoms. Parkinson disease affects about 1 million individuals in the United States and the number is likely to grow as the population ages. Individuals with Parkinson disease have degeneration or premature aging of cells in the brain that are responsible for producing dopamine. The onset of Parkinson disease is most common in those 60 years or older and results in symptoms of tremor, slowness of movement, rigidity or stiffness and impaired balance and coordination. If Parkinson disease is identified in the early stages, before much of the loss of dopamine neurons has occurred it will likely be more responsive to treatments to slow or even halt symptom progression. The loss of smell has been recognized as a possible early indicator of Parkinson disease. Many individuals with Parkinson disease are able to recall losing their sense of smell well before the onset of motor symptoms. Treating with neuroprotective therapies at the time when only the sense of smell is affected provides the opportunity to delay or even prevent the onset of more troublesome symptoms.